Between mentoring the Bible in 90 Days, starting the school year, preparing for our church’s women’s conference, and various fall activities, my personal reading time has been virtually non-existent for the last two or three months! The weekend before Thanksgiving, several of these obligations were fulfilled. It felt like a giant weight had lifted! I was finally able to turn my attention to my neglected “to-read” pile! I wanted to start with something light and fun to help me unwind, so I picked Short-Straw Bride by Karen Witemeyer out of the stack. It was the perfect choice! 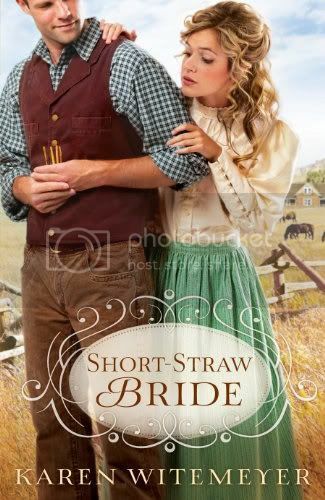 Short-Straw Bride is a sweet, well-written story set in Texas in the 1880s. The Archer brothers have sworn to protect their land at all costs…never leaving and allowing no visitors. Until young Meredith accidentally stumbles onto their property and Travis Archer takes pity on her. Now, years later, she attempts to return the favor. The resulting consequences make for an entertaining, funny tale that will tug at your heartstrings. I really loved the characters in this book…not just Meredith and Travis, but also the rest of the Archer clan: Crockett, Jim, and Neill. The dynamics between the brothers, and between the hero and heroine, were fantastic! I couldn’t put the book down. In fact, I ended up reading the entire book in one sitting…staying awake until 2 a.m. to finish! I’ve enjoyed Karen Witemeyer’s other titles (you can read my review of To Win Her Heart here), but I think this is my favorite so far! I laughed, cried, and was thoroughly entertained by this unique tale. Short-Straw Bride is a definite winner! It was just what I needed to decompress. Thanks so much to Baker Publishing for providing a review copy to me. All opinions are expressly mine. Really it is very interesting book. I like it too much.